AstroJet . A repaint of the FFX B727-200 in the AstroJet paint scheme of American Airlines. This package only includes the textures for those who already have the complete aircraft. Original files Erick Cantu/FFX. Astrojet repaint by Gary D. Jones. 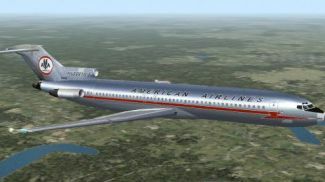 Screenshot of American Airlines Boeing 727-200 in flight. Start FS2004 and select American 727 "Astrojet" from the aircraft menu. Enjoy!! The archive 727_aarc.zip has 36 files and directories contained within it.